Love Manga? Love Back to The Future? Then you're definitely going to want to get your hot little hands on this bad boy! A new Mange version of the beloved time travel sci-fi fantasy is coming. And it's in pretty good hands. 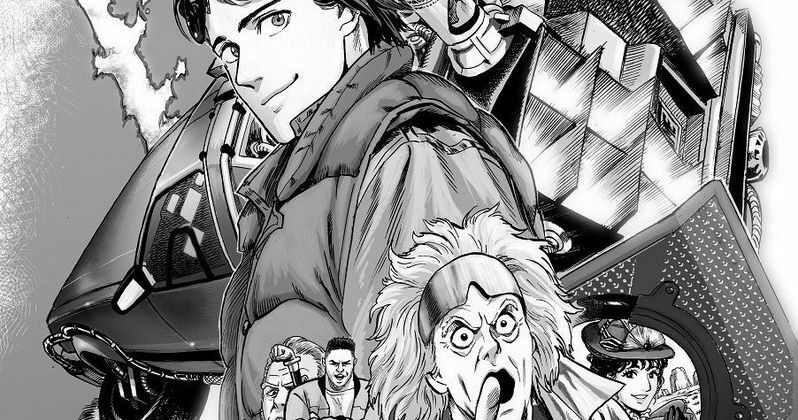 Bob Gale, who created, co-wrote and produced the Back to the Future trilogy is overseeing this new Manga take on his hugely popular 80s property. Even cooler than that, the Back to the Future Manga is coming from Yusuke Murata. The Artists is world renown for his illustrated work on iconic Manga One-Punch Man, for Weekly Young Jump. The Manga isn't taking any wild new approach to the material. It will be directly based on the original film. And it will cull it's story from the screenplay. The Manga is titled BTTF. Murata made it known that he was working on BTTF a few years ago, on twitter. Now, Amazon is sampling some of the art, which you can see below. Back to the Future, and the two sequels that followed, are some of the most beloved genre movies of all time, and were huge blockbuster successes at the time of their release. The original Back to the Future, directed by Robert Zemeckis from a script he co-wrote with Gale, opened in the summer of 85, and went onto become one of that year's biggest releases. And fandom has never slowed down for this quaint tale of a scientist and his high school best friend. In this 1980s fantasy classic, small-town California teen Marty McFly (Michael J. Fox) is thrown back into the '50s when an experiment by his eccentric scientist friend Doc Brown (Christopher Lloyd) goes awry. Traveling through time in a modified DeLorean car, Marty encounters young versions of his parents (Crispin Glover, Lea Thompson), and must make sure that they fall in love or he'll cease to exist. Even more dauntingly, Marty has to return to his own time and save the life of Doc Brown. Yusuke Murata will be using the original script by Bob Zemeckis and Bob Gale, though it isn't known if he'll utilize any of the scrapped ideas that appeared throughout the various drafts before shooting began. The movie originally had a much different ending that saw Marty and Doc visiting a nuclear test site in the 50s, using an actual atomic blast to get Marty back home to the 80s safely. That ending was abandoned in the final drafts, and replaced with the ending we all know now, where Doc and Marty utilize their knowledge of a lightning strike to send Marty back to his life as a teenager in the 80s. Amazon has made some of the art from this Manga available on the site. You can also check it out below, which features a look at Marty, Doc, Biff, Loraine, George and the Hover Board, which indicates that the entire saga will be told, not just the first movie. Even though Steven Spielberg, Robert Zemeckis and Bob Gale have all vowed not to ever remake Back to the Future, we have to wonder if an anime remake is out of the question. This news first dropped at Kotaku.